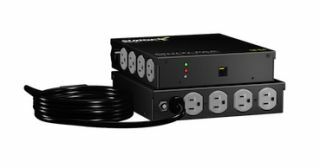 ESP/SurgeX has introduced the Defender Series MultiPak, a Multi-Stage surge protector and power conditioner specifically designed to safeguard digital signage arrays. Available in four (SX-DS-154) and six (SX-DS-156) outlet configurations, the MultiPak provides advanced protection against damaging surges, spikes, over/under voltage, EMI/RFI noise, wiring faults, and other power issues that can degrade video display performance. The unit's compact design fits behind multi-panel installations and easily integrates with wall and ceiling mount systems. Developed in direct response to the challenges encountered by digital signage manufacturers, the MultiPak was engineered to keep digital displays running properly without interruption. Digital display systems rely heavily on sensitive integrated circuitry for optimal performance. Superior power protection should be a top priority and the MultiPak answers this need by safeguarding equipment from disturbances on video, data, and power lines that can result in fuzzy images, audio noise, and render equipment inoperable-leading to negative perceptions, reduced lifespan, downtime, and lost income. From top to bottom, every specification in the MultiPak is geared toward keeping video wall arrays running without disruption. In addition to its Multi-Stage surge protection technology, the MultiPak includes other SurgeX patented technologies that contribute to longer product lifespans and better performance. COUVS (Catastrophic Over/Under Voltage Shutdown) insures multi-panel displays will not sustain catastrophic damage from having too little or too much power voltage coming from the AC line. SurgeX ICE (Inrush Current Elimination) technology with zero cross turn-on removes the need for time delay circuit breakers or startup sequencing. This allows displays, amplifiers, and other equipment to be powered all at once without worry of blowing a circuit breaker. With its compact design, the MultiPak can be concealed from view and will fit naturally within common mounting mechanisms. The 15 Amp load rating is robust enough to handle the power delivery demands of multiple displays, all from a single unit. "We listened to our customers and came up with a unique solution that offers all the surge protection and noise eliminating features needed to keep multi-panel displays working without disruption," said Stephen F. Galloway, president and CEO ESP/SurgeX. "We're confident the MultiPak will exceed the expectations of manufacturers and their customers." In addition, the Defender Series MultiPak includes diagnostic software that enables technicians to easily troubleshoot and diagnose power related disturbances. It offers the ability to customize power protection settings, download time-stamped reports, and diagnose power related service calls proactively. The all-inclusive MultiPak provides all of the tools needed to protect, manage, and analyze a business's digital display investments. The SX-DS-154 and SX-DS-156 are currently shipping.